Physical activity is important at all stages of life. It prevents obesity, improves well-being and reduces the risk of many chronic conditions, such as heart disease, arthritis and diabetes. Evidence shows that being active at a young age tracks into adulthood, and that physical activity behaviours adopted when young are likely to carry through life. And now our study of babies’ activity levels has shown how different factors, including sleep and diet, link together to improve baby health from the day they are born. For our research project, we tracked the physical activity of 141 12-month-old infants (77 boys and 64 girls) using accelerometers, which they wore on their ankles for a week. We looked at how active the children were during the day and at night. Then we compared the different characteristics of the most and least active children. This involved using the accelerometer data, information that we collected from measuring the infants at home – things like weight and diet diaries were included in this – and medical records from the mothers’ pregnancy, as well as the the infants’ own birth and GP records. Overall, the research showed that getting the right start means that other healthy behaviours fall in to place more easily. Across the board we found that active babies are healthy, are of good weight and are born full term. In addition, the larger babies who had been born full term were more active. We found that diet is an important factor when it comes to being an active child. The children who were breastfed (breastfeeding has been associated with higher fitness levels in childhood) and those who ate more vegetables were more active. Infants who were less active had a more adult style diet, with juice rather than milk and adult crisps. As well as improving their activity levels, healthy eating behaviours, such as having a higher vegetable intake, adopted at this age are likely to be carried through life too. This, when combined with another finding that infants born prematurely, and who do not put on weight well after birth, move less, also suggests that preterm and low birthweight infants should be breastfed for longer, and that a healthy diet of milk and vegetables is even more important for them. We also found that active babies sleep better than less active babies. 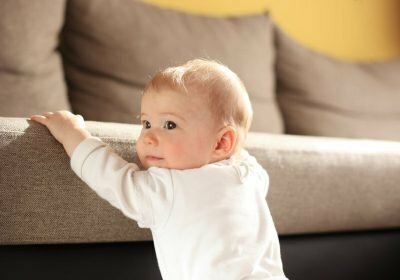 Those infants who were active during the day woke up less at night, so they tended to sleep better – although they did move about in their sleep more. This suggests that encouraging activity could have a knock-on effect on improving other behaviours like good sleep practices. The data showed that boys are more active than girls in general, even at 12 months old. Although we are not sure if this is because boys are inherently more active than girls, or if parental behaviours encourage boys to be active, and that parents accept boisterous physical behaviours from boys but not from girls. Given the link between early movement and physical activity later in life, this finding raises questions about how we address girls’ physical activity. Are girls inherently less active or are they taught to be less physical? Is a boy climbing the curtains just acceptable behaviour while we worry that a girl climbing will get hurt? Is it nature or nurture that makes girls less active than boys? Though we can’t answer these questions solely based on this study, another recent project of ours has highlighted the frustrations girls feel towards activity through to their teenage years. Girls report there are many activities for boys but few for girls. But if girls are inherently different from boys in their activity rates, perhaps we should be tailoring activity for girls rather than assuming the want to do the same as boys. The finding from our study of infants gives more weight to the argument that we need to rethink our gendered perceptions of activity.